The Jolly Giant has a deep, abiding, unquenchable love of quality beer so it’s no surprise he chose to hold his birthday celebrations in a pub. On my urging he chose a gastropub, the Tower Bridge branch of The Draft House, so that his non-drinking chums like me could still have something to do while everyone else became progressively merrier. The Draft House’s other two branches are located in Clapham and Battersea, but the Tower Bridge branch has the advantage of literally being a stone’s throw away from the iconic bridge which makes an ideal location for inebriated cavorting. 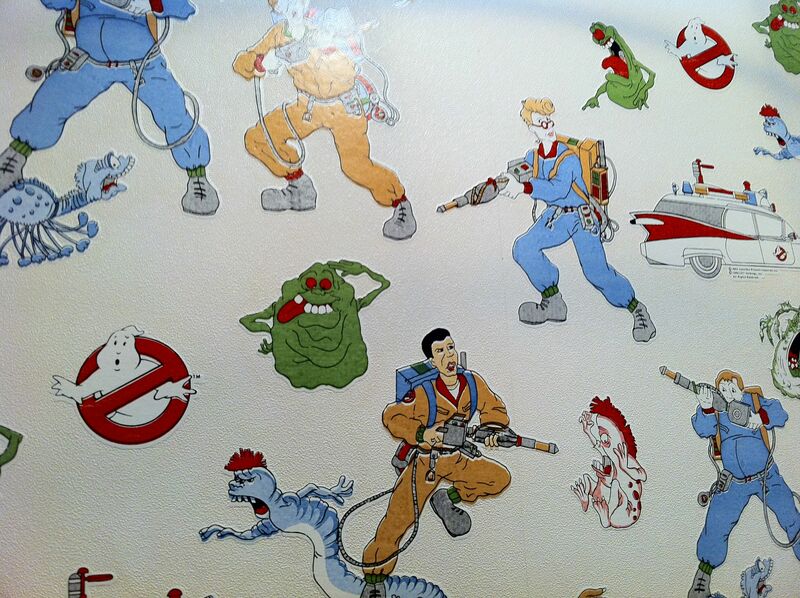 The interior is largely unmemorable apart from the hallway leading to the downstairs toilets which was decorated with Ghostbusters wallpaper for some reason. It’s quite cute really. Who you gonna call? An interior decorator? No! My mum! Even though The Draft House was remarkably quiet and empty on the Jolly Giant’s Saturday evening celebration, the staff were coma-inducingly slow in getting us seated, bringing us menus and taking our orders. Food can’t be ordered at the bar and we weren’t allowed to sit and order food at the long bar-like table table running down the centre of the room which was reserved for drinkers. If management is going to insist on such strictness, then the staff should pull a finger out and actually provide a respectable level of service. Perhaps the incentive of a tip, rather than a set 12.5% service charge, would light a fire under their arses. I washed away my bitterness with a cool bottle of root beer – a sadly underappreciated non-alcoholic drink that’s difficult to find in London and almost as expensive as alcoholic beer when you can find it. The Jolly Giant, the Lensman, Wicket, the Youngling and Bohemian Rhapsody seemed to enjoy themselves working their way through the dizzying selection of beers. Bohemian Rhapsody seemed particularly taken with the 99 Red Baboons. The euphemistically named ‘small sharing plates’ could be called tapas if you’re feeling generous and overpriced bar snacks if you’re feeling grumpy. The Youngling ordered anchovy fish and chips. The chips weren’t as crispy on the outside and fluffy on the inside as we would have liked, but they were pleasurable enough. The battered anchovies were quite flavoursome in their saltiness and tanginess, but they’re not nearly as intensely addictive as the Cantabrian anchovies at Terroirs. Not a bad effort, but the portion was a touch small for £3.75, even for a small sharing plate. 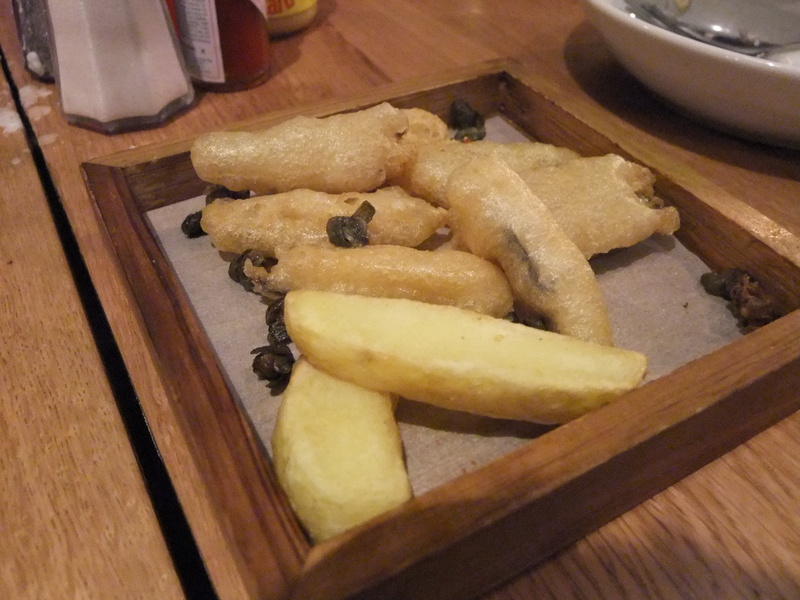 Anchovy fish and chips is an inspired idea. Both the Jolly Giant and The Griddler raved about the scotch egg. Despite my initial scepticism, I was won over. The crisp crumb exterior gave way to a succulent ball of herby pork surrounding what was essentially a delicately poached egg. It’s a very flavoursome combination and is a far cry from the stodgy scotch eggs found in lesser pubs and supermarkets everywhere. 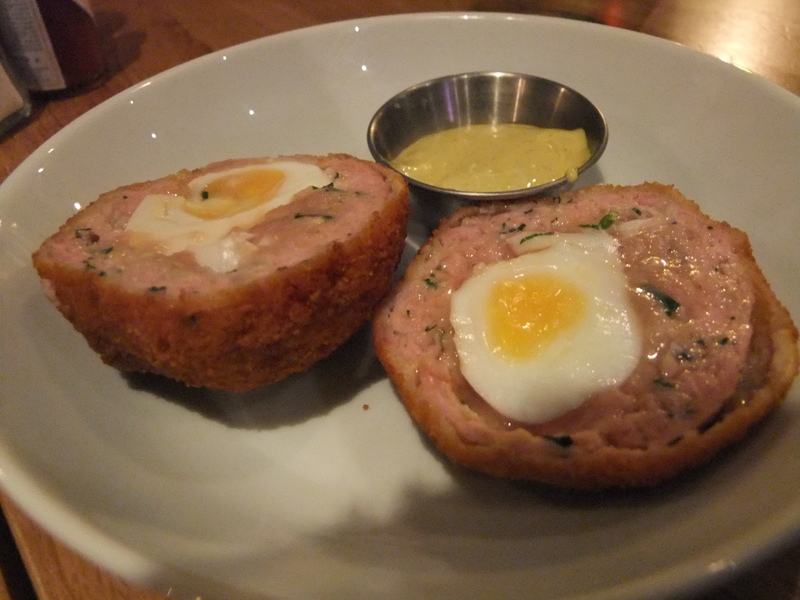 If only all scotch eggs tasted like this. Wicket and I arrived late, so the Jolly Giant had already polished off his meal but that didn’t stop me from filling my belly. 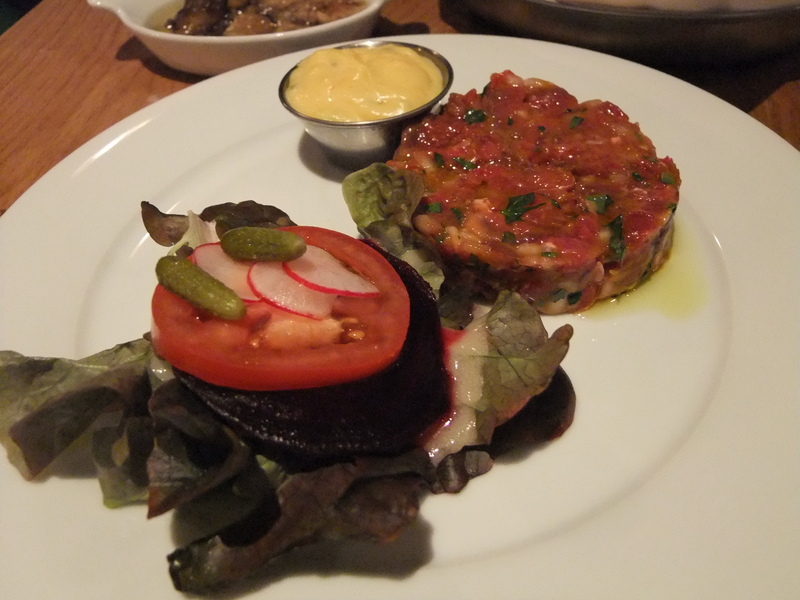 I ordered the steak tartare with some trepidation as I have yet to find a good steak tartare in London. All of the steak tartares I’ve had to date in London aren’t a patch on the ones I’ve had in Paris. The Draft House’s version was juicy and had a soft, almost jelly-like texture. It was lightly spiced with some herby accents. It’s certainly the best steak tartare I’ve had in London so far, but it’s still not quite up to the standards of the best French versions of the dish I have had which benefitted from a coarser, slightly firmer texture and a more interesting dressing that better accentuated the meatiness. My meat streak continued with the roasted bone marrow. 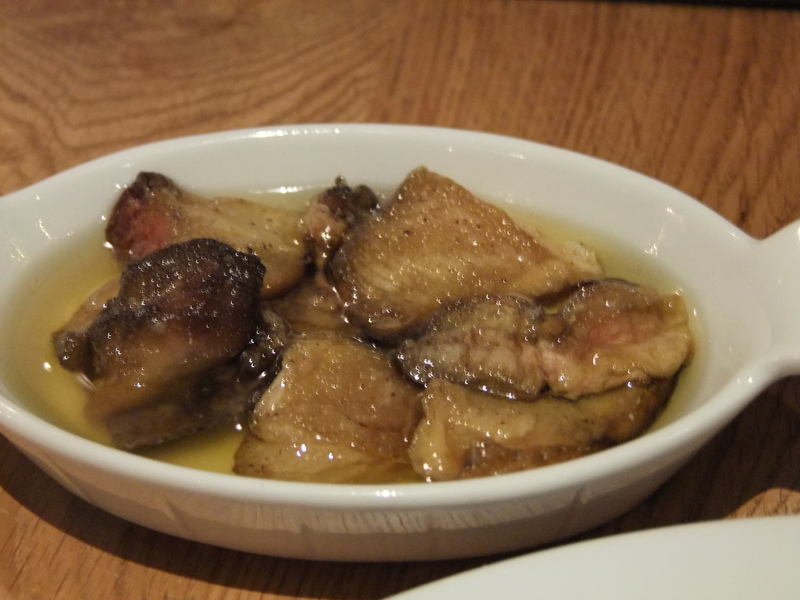 Although just as quiveringly, delicately soft as the version often found on the menu at St John, the bone marrow here was incredibly salty and served in oil. I’m far from adverse to salty food, but I could feel my blood pressure rising with every spoonful. Bone marrow can actually be quite tasty. Onion rings, despite being a deceptively simple dish, is quite hard to do well. 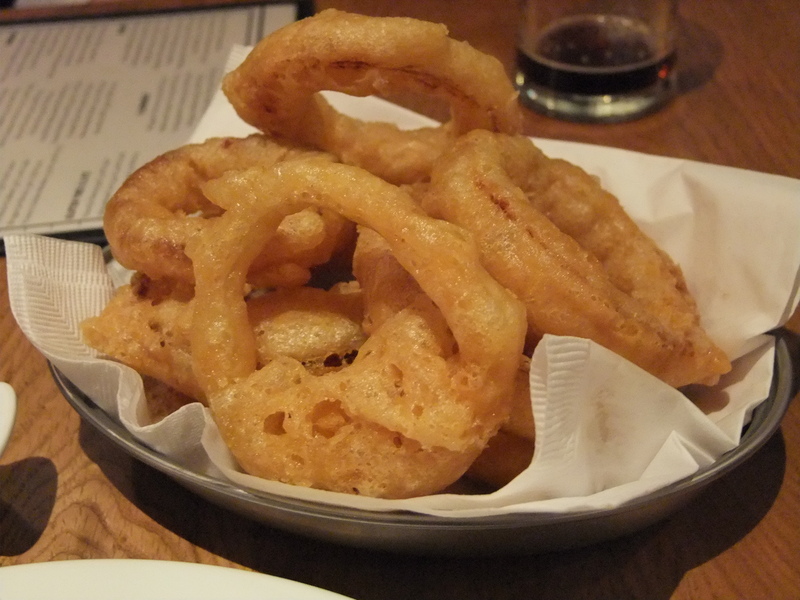 The Draft House’s onion rings illustrate this nicely – although there is a whole, sliced ring of onion in the middle of all that batter, the batter spoils it by being far too oily. The batter is also far too crunchy when it should be crispy and then fluffy. They’re not as bad as Meateasy’s, but they’re not as good as Byron’s either. I may be getting onion ring fatigue. To finish it all off, I opted for a dessert of vanilla panna cotta served with rhubarb compote. 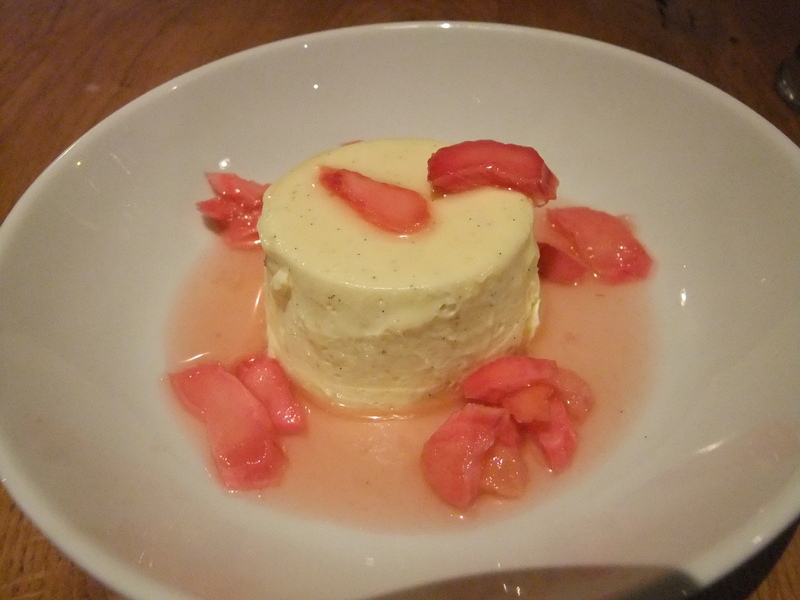 I never used to like panna cotta, but I was converted after having a particular delicious example at Trishna. The panna cotta was firm yet yielding, but the vanilla flavour was understated. The rhubarb compote lacked the glossy, shimmering appearance of the version at the Dean Street Townhouse and also tasted too tart instead of having just the right balance of sweetness and tartness. Disappointing. The Euro Hedgie would not approve. The Tower Bridge Draft House is tricky to judge. Based on the inebriated state of some my dining companions, it’s a fine drinking pub. As a place to eat, it clearly has potential for brilliance given the surprisingly good scotch egg, but almost everything else about my meal was merely satisfactory or even slightly disappointing. It’s worth visiting if you happen to be in the area, but the staff both in the front of the house and the kitchen will have to push harder to make it a place worth travelling for. Nevertheless, since the Euro Hedgie lives nearby, I suspect I’ll be making a second visit sooner rather than later. Total cost for one person including soft drink: £28 approx. Tags: anchovies, bone marrow, chips, fish, onion rings, panna cotta, rhubarb, scotch egg, tartare. Bookmark the permalink. Next time, try the Bridge House a little further up towards the bridge itself. It’s an Adnams house, so good for the beer drinkers, but it’s also not too shabby on the food front. It’s been there for a while now and has been consistently good all the time I’ve known about it. More info here. Thanks for the suggestion. I may do that, but as a non-drinker I’m more interested in the food than the beer so I wish there was a menu online somewhere. In any case I paid a second visit to the Draft House – second review coming shortly! They change the menu quite a lot — I’ll see if I can get a photo of it next time I’m there. Oh! here is one from 2008. Thanks for the link, but if you could make it publicly viewable so other readers don’t have to have a Flickr account to see it, that’d be great. Cheers! Sorry, I am an idiot — it was private and I didn’t realise! Fixed now.